With the exception of John Eldred the traveller and merchant none of the men mentioned here found more than local fame. Alas, no notable women are recorded in connection with New Buckenham except the beautiful Queen Adeliza widow of King Henry I and wife of William d’Albini, builder of Buckenham Castle, and the redoubtable Alice Knyvett who defended it in her husband’s absence in 1461. But the Castle belongs strictly speaking to Old Buckenham. 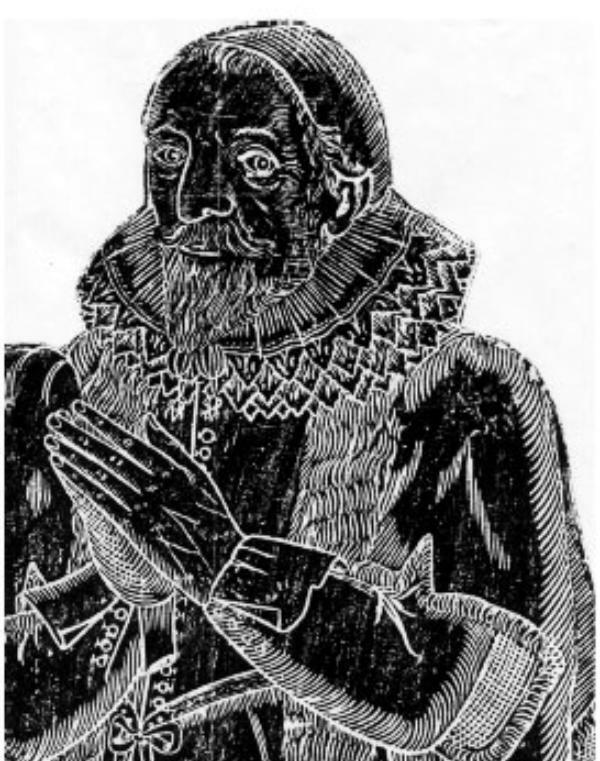 John Verdon is known mainly from his will, dated 1490 but not proved until 1501. The Verdons had grown prosperous in the service of the Knyvetts and as John had no children, after making provision for his wife and mother he left all his property to pious and charitable uses. He owned at least six houses in New Buckenham and land in four nearby parishes. The legacies included payments for a mass of the Name of Jesus, to Old Buckenham Priory, for the repair of Carleton Rode, Forncett, Fundenhall, and Tibenham churches, and to St Martin’s guild at New Buckenham. He left 20s. for the repair of the guildhall of St Mary and this is of special interest because it probably documents the addition to the guildhall (now the ‘Old Vicarage’) of the westernmost bay of the building. This has a different roof structure from the 15th-century remainder. He also left to New Buckenham a house that he had bought of John Hewytt ‘for the relief and comforting of the poor people for ever more’; this became known as the ‘Town Houses’. John Eldred is New Buckenham’s most famous son. His father, also John, hailed from Knettishall just into Suffolk where the family had lived for several generations, but his mother was probably from Morton-on-the-Hill near Lenwade in central Norfolk. 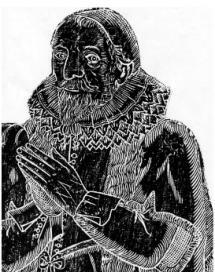 John the father was a husbandman or small farmer at New Buckenham and he died in 1558 leaving a young family. Under his will his daughter Margaret was to receive £20 at the age of 21 and his wife (also Margaret) was to have their two sons Peter and John ‘brought up to learning’. John, born in 1552, must have been an apt pupil. He seems to have left for London when still a lad and he quickly prospered. Already a well-to-do merchant, on Shrove Monday 1583 he made one of a company which set out in a ship called the Tiger on a long- distance trading venture. Selecting Aleppo as his headquarters he made a number of journeys to Bagdad (then called Babylon) and included sightseeing trips to Antioch, Tripoli, Joppa and the Holy Land. He arrived back in the Thames in March 1588 with the richest shipment of spices and other merchandise ever to come to England. Now very wealthy, in 1597 he bought the manor of Great Saxham near Ickworth in Suffolk and built the mansion there which was to be called Nutmeg Hall. He kept his London interests and became a founder member of the East India Company and secured a Crown monopoly in the marketing of tin. Dying in 1632 he left a big family but the line failed in 1745 and Nutmeg Hall was burnt down in 1779. However, his monument in Great Saxham church can be seen with the words: ‘The Holy Land so called I have seene And in the Land of Babilon have beene’ John did not forget New Buckenham. His brother Peter remained here and with John inherited the family home in 1599 after their mother’s death. It was on the site of ‘Market Place’ the mid 19th-century house south west of the market cross and it was sold in 1602. In 1610 John bought a tiny manor in New Buckenham that had originally belonged to Old Buckenham Priory. He conveyed it in 1617 in trust to pay £12 a year for a ‘learned, godly and religious’ minister at New Buckenham ‘free from occasion of scandal and viciousness of life’ to ‘instruct and catechise ... the people both young and aged’. The charity was wound up only in 1996. He comments that the minister’s stipend was ‘very little for a learned and painful preacher’. His famous voyage in the Tiger is mentioned in Shakespear’s Macbeth.